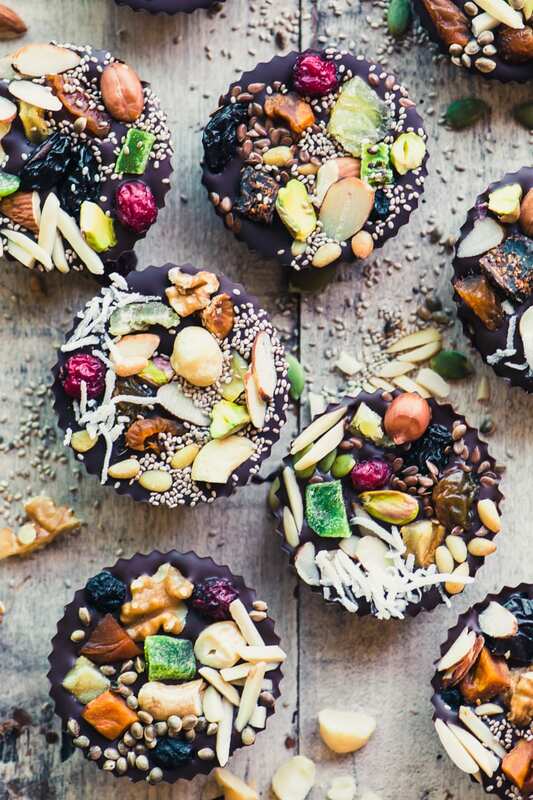 Detox Dark Chocolate Almond Butter Cups ~ when I need a little something sweet but don’t want to wreck my diet with a pint of ice cream or a stack of cookies, I go for one of these healthy dark chocolate almond butter cups, they satisfy my cravings without putting a dent in my healthy lifestyle! 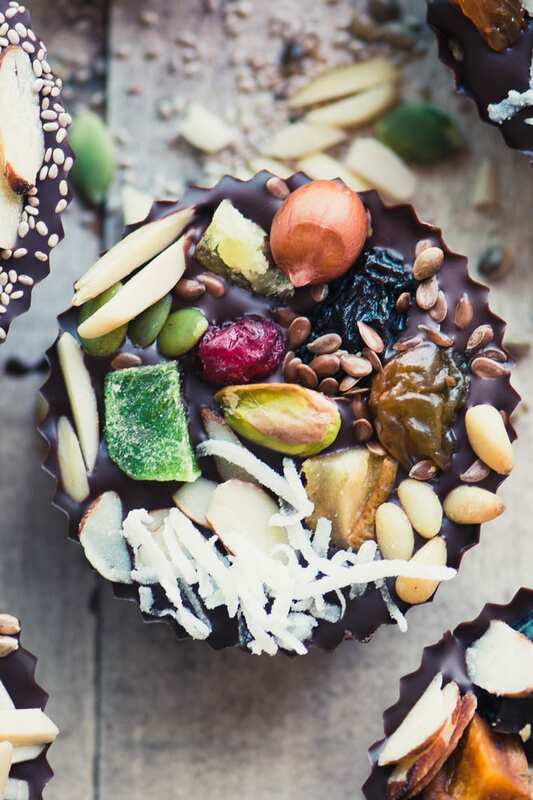 Of course I’m using the word ‘detox’ with a wink and a nod ;) just like I did with my DARK CHOCOLATE DETOX BITES, but these luscious homemade almond butter cups definitely fall into the super food category ~ made with the darkest chocolate, pure almond butter, and lots of healthy fruits, nuts, and seeds. In fact, these dark chocolate almond butter cups are the one of the best examples of good and good for you I’ve found. I had fun rummaging through my cupboard for all the dried fruit, nuts, and seeds that I had stashed away. These are the same goodies I use in my chunky fruit and nut breads, like my PALEO FRUIT AND NUT BREAD, and my CHUNKY FRUIT AND NUT QUICK BREAD. It’s nice to have a good variety around so you can mix and match them like this. 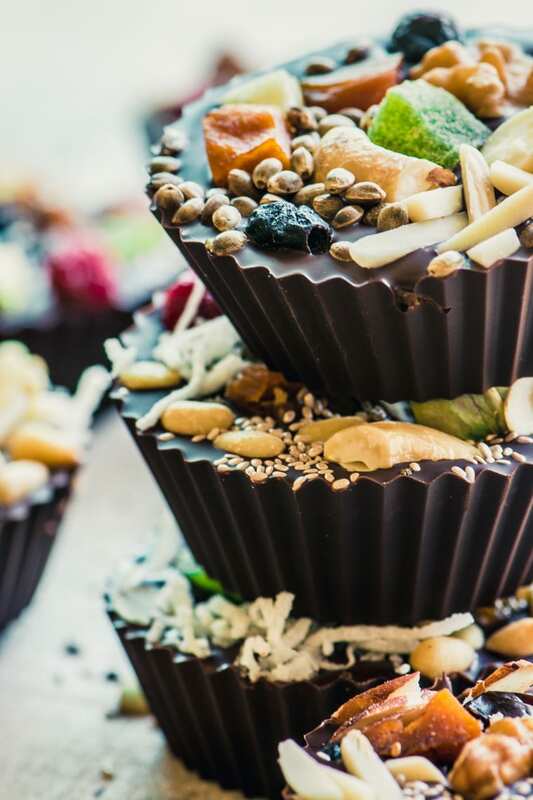 The fruit adds sweetness and color, and the nuts and seeds add the perfect earthy crunch to a classic nut butter filled chocolate cup. TIP: Lots of stores have bulk bins or special sections where they stock bulk dried fruit and nuts. Look for cranberries, cherries, kiwi, pineapple, and papaya to add a pop of color to your cups. These are the perfect little mid-day pick -me-up, or after dinner treat. You can make them as big or as small as you like, depending on your mold. 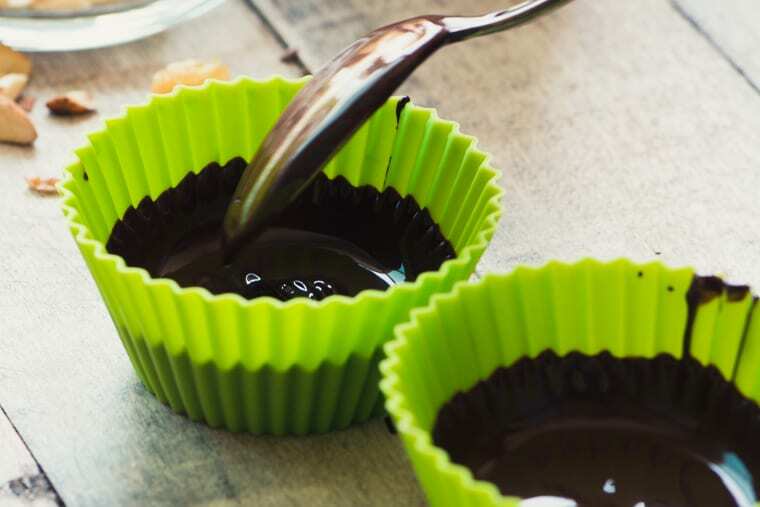 I used standard size silicone muffin liners which are just right for a substantial cup, but you can make bite sized minis, if you like. These reusable liners can be used for baking as well as all kinds of candy making. They hold their shape and peel off easily. You can buy them in all shapes and sizes, and it’s just one more way to cut down on waste in your kitchen. 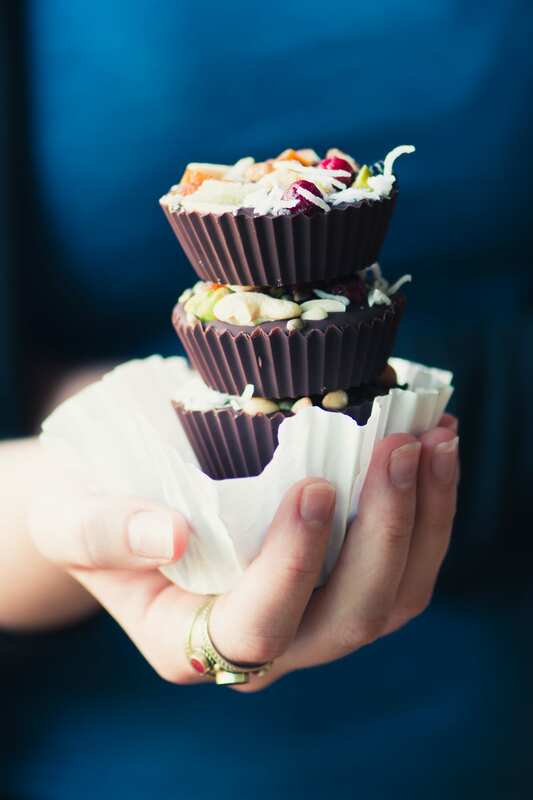 Once the chocolate hardens, you can easily pop our your almond butter cups, just peel them away just like you would with paper. Use your favorite chocolate for this recipe, but remember that the darker it is, the healthier. I recommend at least a 60% cacao chocolate, and you can go as high as 90% for a super bittersweet flavor. For convenience I use Ghirardelli 60% Bittersweet Chocolate Chips. They’re always available at my supermarket and I like to have them around for baking anyway. First roast your nuts to boost their flavor. Put them in a single layer on a dry baking sheet in a 350F oven for about 15-20 minutes, giving the pan a shake now and then. When you smell a nutty aroma, they’re done. Let them cool right on the baking sheet. There’s no need to remove the skins from your nuts, they’ll add flavor to your butter. Put your cooled nuts into a food processor or high speed blender and processing until creamy. Scrape down the sides of your machine or blender often as you go. First your mixture will seem dry and gritty, but keep going, it will start to break down and will finally melt into a creamy butter. If for any reason your nuts are very dry and you have trouble getting them to break down into butter, add a little bit of vegetable oil to the processor. Add salt if you like to the finished butter. You can also add other flavors like vanilla or cinnamon. 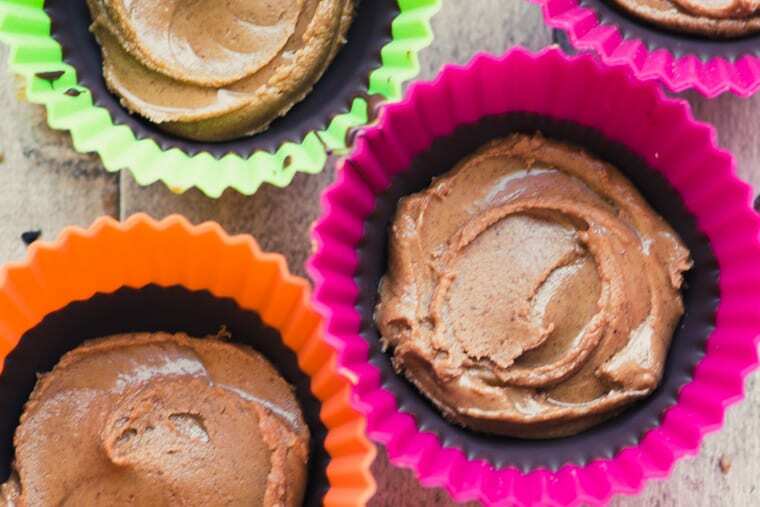 Homemade Dark Chocolate Almond Butter Cups ~ because nobody should have to choose between healthy and dessert! Use any chocolate you like, including milk or white. Fill with any nut butter you like ~ I think white chocolate pistachio butter cups would be delish. 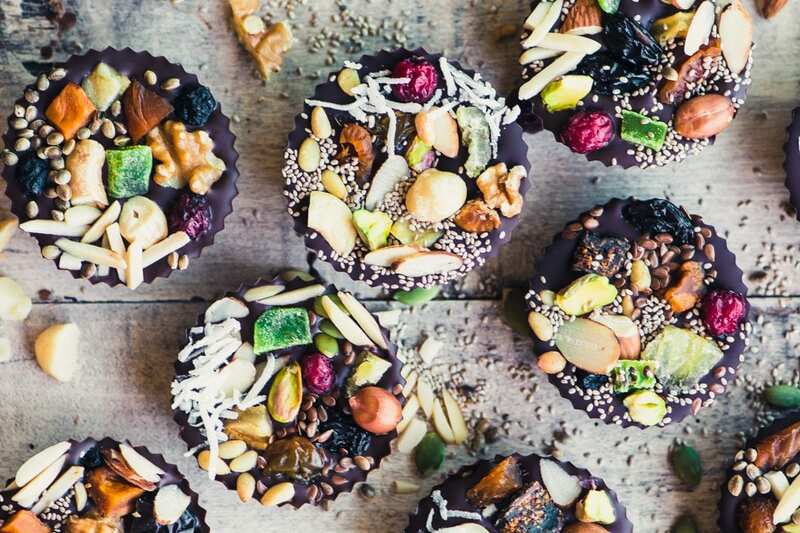 Thanks for pining these Detox Dark Chocolate Almond Butter Cups! 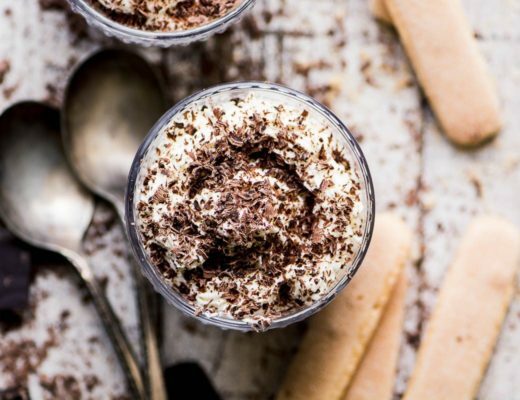 OMG, these are totally decadent and satisfying. I made them the day after you posted b/c I couldn’t stop thinking about them. And the pecan nut butter–much better than almond and peanut butter! Thanks for sharing such an amazing treat. You’re so welcome Maria, and I really appreciate your taking time to come back and report on these :) I need to make them with the pecan butter myself. Oh gorgeous!Can I use some coconut oil instead of almond butter? Want to make some tomorrow!!???? They look amazing! A tablespoon of coconut oil inside would not taste good, but for those who like coconut, perhaps some coconut butter or ground coconut would work. Just my thoughts. I think that would work, Shelley…maybe some shredded coconut and sweetened condensed milk filling? I’m thinking something like Trader Joe’s Sunbutter? The almond butter is the filling. just like in a peanut butter cup, Monique, so I don’t think you can substitute coconut butter, but if you can’t tolerate nuts, you might try sunflower seed butter. I do that too, Tricia, and yes, this is definitely an upgrade! 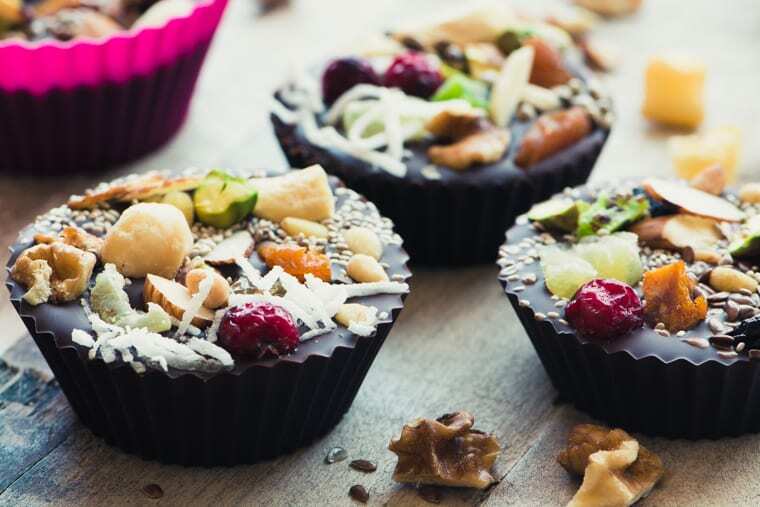 This is more like intox than detox; the combination of dark chocolate with nuts and fruits in just a small bite is wonderful. Thank you, Sue! What do you think about adding some hot pepper? Now you have me wanting to try these! 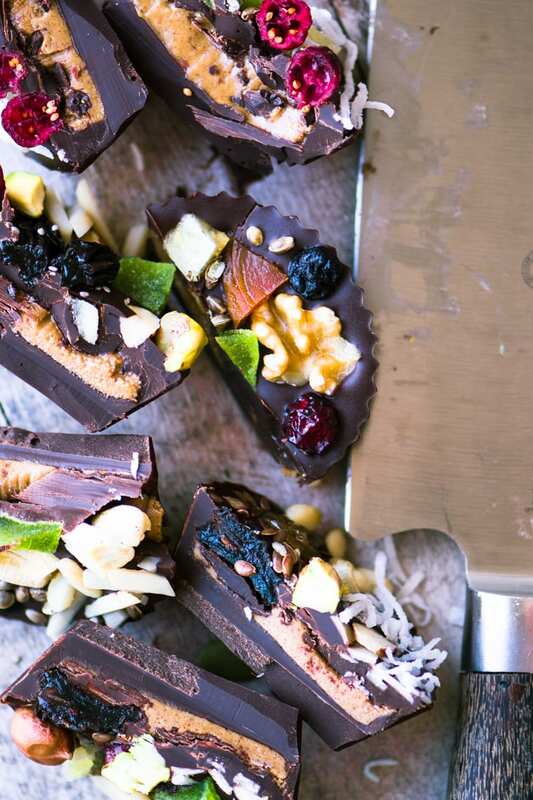 Usually, I scroll past homemade peanut butter cups – but almond butter and the fruit?? Yeah baby! :)) The almond butter really does sound better than pb, doesn’t it? These are gorgeous!!! A great healthy snack to handle those chocolate cravings!! Chocolate cravings are too powerful to resist! I will detox all day every day from here on out! YUM! Beautiful photography, too! These are awesome, Sue. Calorie bombs, but good for the soul and body. First off, your photos are absolutely beautiful! 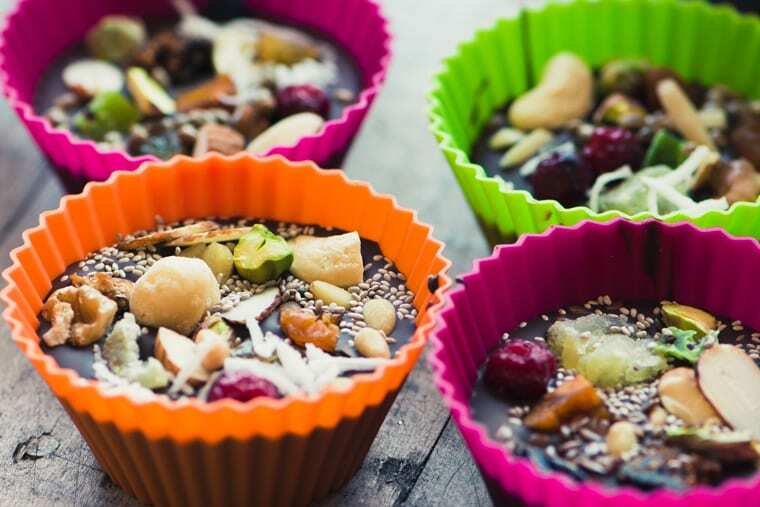 These look amazing – a total treat while you detox ;) although I couldn’t confidently say they would last long! 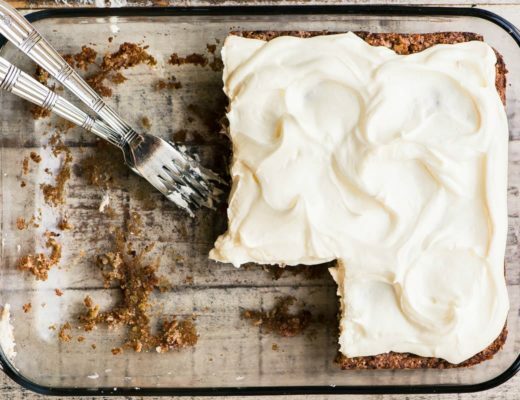 I have a sweet tooth, and these treats will satisfy my sugar cravings. Plus, each bite-sized morsel is perfectly portioned. Yes, please! These are so pretty and I love that they’re decently guilt-free! I have everything I need to make them, woohoo! 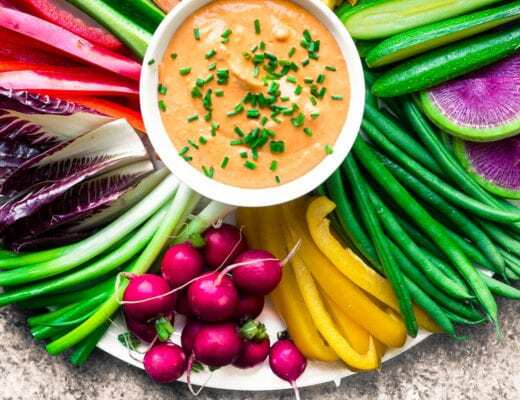 It’s nice when delicious and healthy can coexist!